This colonial Jean Bonnet Tavern has historic ties to the 1700s, George Washington and the Whiskey Rebellion. The small community of Bedford County takes pride in its Pennsylvania Colony History and the preservation of its historic buildings. 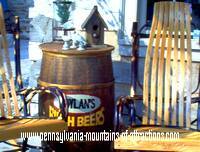 Many of these historic Pennsylvania attractions can be found along the Lincoln Highway. The namesake, Jean (John) Bonnet, and his wife purchased the property in 1779. In October 1780, Bonnet was issued a license, allowing that "Petitioner lives at the Fork of the roads leading to Fort Pitt and the Glades, with everything necessary for keeping Public House. Have you heard the legends of the Haunted Jean Bonnet Tavern? There are many documented tales of the ghostly tavern. To this day visitors add their testimony to the legends. Colorful moments were shared when the tavern became a meeting place for farmers involved in the Whiskey Rebellion. In mid-1794, Pennsylvania farmers, angered by the federal excise tax on whiskey, met here and raised a liberty pole in protest. Then in October 1794, troops summoned by President George Washington camped at the building, now known as Jean Bonnet Tavern, on their westward journey to quell the insurrection. Earliest record of this property is noted in a transfer of title of 690 acres from an agent of the William Penn Family to Hans Robert Callender, and Indian trader. Callender was also a commissary for troop supplies, and later, a scout for General George Washington. This building, with its native stone walls, massive fireplaces and chestnut beams, was built during Callender's ownership. 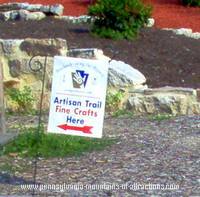 Travelling along the Historic Lincoln Highway and experiencing the Artison Trail isn't just a shopping experience, it's a step back in time when artists through the Allegheny Mountains enjoyed building a home business and used their artistic skills passed down from generations past. The picture at the left was taken at Jean Bonnet Tavern Artison Trail gift shop that is located in front of the Tavern. The Jacob family welcomes its visitors to a yesteryear experience of old tavern charm. They have a long tradition of hospitality, good food and drink of this 1760s historic landmark. Delicious food and carefully selected, and expertly prepared for a pleasant dining experience. When was the last time you experienced eating a meal on pewter dinnerware? The Jean Bonnet Tavern was destined to play in several historical roles. Due to its location, it became an important haven for early settlers and travelers. It was built on the only road connecting eastern Pennsylvania with the Ohio River and territories beyond, at the junction of the Old Forbes and Burd Roads (Routes 30 & 31). Visitors to the Jean Bonnet Tavern can enjoy two floors of find dining. The downstairs dinning room has a full menu and is known as the main restaurant. The upstairs is known as the tavern. The second floor also has an outside dining area. Beside the fine dining the Jean Bonnet Tavern is also popular for its Bed and Breakfast. 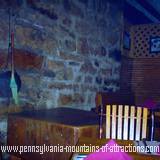 Visitors can enjoy spending the night in this Pennsylvania Colonial Tavern and enjoy a complete breakfast before venturing on historic tours of Bedford County or down the PA Lincoln Highway. 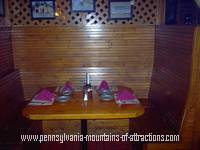 In a small way you too can be a part of Pennsylvania History by signing the guest book at the Jean Bonnet Tavern. Become part of an historic list of friends and visitors, from near and far who have traveled from all over the world to experience this historic tradition of Pennsylvania hospitality.